‘Homer Lee’ is none other than Branson, Missouri’s favorite comedic actor, Terry Wayne Sanders. He’s the busiest comedian in town with 16 different jobs in the entertainment field! He’s still going strong in his 38th year as a comic headliner now known as ‘The Face of Branson’! Entertaining literally millions of people just like you at Silver Dollar City (an 1880’s themed park in Branson) with a wide range of characters have afforded Terry “Homer Lee” Sanders, the opportunity to work with Dolly Parton, Kenny Rogers and the late Bob Hope. Terry has received the award/title ‘COMEDIAN OF THE YEAR’ 4-times! He has his own TV show on The Vacation Channel called ‘Branson Country’ with ‘Terry the Tour Guide’ playing 8 characters in that timeframe. This is his 19th season filming this highly rated TV show in HD! A veteran in films with Annie Potts, Tim Curry and Leslie Nielsen, Terry prefers the one-on-one touch and intimacy with audiences in live performances. In addition to his regular performances at Silver Dollar City and in The Shepherd of the Hills play in Branson playing several roles, Mr. Sanders was the comedian at the Braschler Music Show for 17 years. His comedy antics earned him a regular spot on television’s Hee Haw where he worked exclusively with Roy Clark, Grandpa Jones and Minnie Pearl. Since then he’s had the pleasure of working for many shows in Branson, MO. like Pierce Arrow, The Grand Jubilee, The Branson Brothers Show, & Shoji Tabuchi as well. This is Terry’s 2nd season to be the comedian for ‘Classic Country’s Patsy Cline Show’ with CJ Newsom here in Branson! This is Terry’s 16th season performing in The Shepherd of the Hills play. Terry’s sons, Austin & Evan Sanders also perform in America’s #1 outdoor drama “The Shepherd of the Hills’. 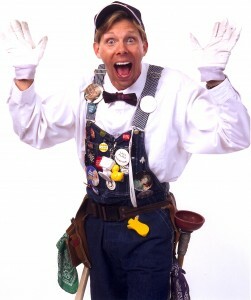 He is also the host of many personal appearances at Big Cedar Lodge near Branson 10 years! He’s in his 10th season to perform at the Baker Creek Seed Company in Mansfield, MO., & 10 years as ‘Barney Fife’ for the Muscular Dystrophy Association & thehir ‘lock-ups’.